Summer is a time to be creative, and what better way to show off your children's talents than to have them stage a puppet show? Whether they make use of finger puppets, sock puppets or marionettes, everyone loves to watch puppets on stage. Depending on the age of your children, the show can be as simple or as elaborate as you wish – and they can even charge admission! A puppet theatre can be costly, but it's easy to make your own. 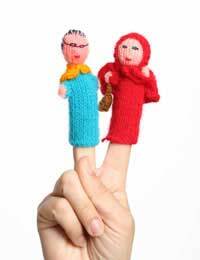 With young kids, the simplest way is to turn over two chairs and put a blanket over them, so the puppets can perch on top – easy enough if you have small finger puppets for tiny hands. You can also stage your puppet show by covering a bookcase or table with a blanket or cloth, or even use the back of a large armchair or couch. If you want to build a larger stage for bigger puppets – and older puppeteers - take a large cardboard box, cut out the back and paint it. Add curtains by gluing or taping felt on pieces of fabric in front. Decorate as you wish, using royal colours such as dark red, green and blue. Simply glue (or sew) buttons for eyes and nose, pipe cleaners or felt for a mouth, wool for hair etc. You can make use of dolly clothes if you wish, or make your own. You are only limited by your imagination – and that of your children. Younger children in particular will want a simple storyline for their puppet show, either making one up impromptu as they go along or loosely following the storyline of a book or fairytale with which they are familiar, such as Little Red Riding Hood or The Three Bears. Older children might want to actually write their own storyline beforehand and stage rehearsals to make sure they get it right. If this is a three-day affair, the longer the better! As long as the production can keep their interest, who's complaining? Children love to pretend they are imitating real life. If your kids want their puppet show to be as realistic as possible, here are some added extras to make it extra special. Advertise the show. Have your children make colourful posters to advertise in advance. Make a programme. Use the posters as a guide for the programme cover, then help them to write down scene descriptions with a brief synopsis of the show inside along with a list of actors and other production staff. “Sell” tickets. Anything will do, just scraps of paper with a stamp or drawing on them. You might want to “buy” them with a sweetie, or with real or pretend money. Have an interval. This gives the impression of the show being more real than it actually is, and also will allow the actors and puppeteers to regroup and collect themselves while the audience relaxes. Serve refreshments. Offering parents and other theatre-goers refreshments is one of the highlights of the show, if not THE highlight. Help children to prepare drinks and biscuits or sweets ahead of time, which they can pass out on small trays or plates. It doesn't matter if your puppet show is elaborate as the one the von Trapp family put on in A Sound of Music. All that matters is that your children have a good time staging their production, and that they have an appreciative audience. Enjoy their childhood artistic endeavours while you can – before you know it they'll be just a memory!